Take a look at best sellers and novels, now available in Triton's College Catalog. The McNaughton Recreational Reading Collection is a changing collection of current best-sellers and novels. The collection is located in the northeast corner of the Library with a sign that says "Recreational Reading." These books are searchable in our online catalog and may be checked out for four weeks on a first come, first served basis. How to find books from the Recreational Reading Collection (also known as the McNaughton Collection) in our Library catalog. 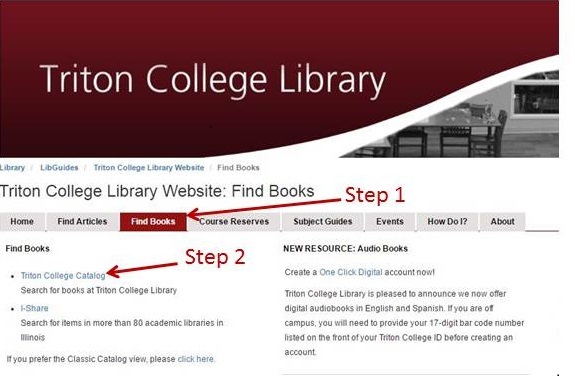 Step 1: Go to the Triton College Library home page and click on the “Find books” tab. You are now looking at the Library's catalog. Step 1: Type “recreational reading” in the search box [include the quotation marks]. Step 2: Click the “Find” button. All items in our Recreational Reading collection will display.